Some books are so good that, having read them in print, I can’t wait to hear the story all over again in an audio version, with professionally rendered accents and inflections. 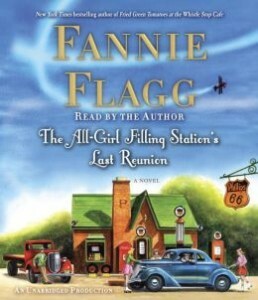 Fannie Flagg’s latest novel is that kind of book. I’ve read it and listened to it, and I’m still smiling. THE ALL-GIRL FILLING STATION’S LAST REUNION. By Fannie Flagg. Read by the Author. Random House Audio. 11 hours, 9 compact discs. $46. Also available in hardback from Random House. 386 pages. $27. Are you who you think you are? That’s a question Mrs. Sookie Poole had never bothered to ask herself. If anybody knew who she was, it was Sookie. After all, she’d been told over and over, all her life, by her domineering mother Lenore Simmons Krackenberry. Sookie was a Simmons, with all the attendant rights and responsibilities. Especially the responsibilities. Lenore, however, is not inclined to leave Sookie in peace. Lenore is quite a character in the Southern matriarch tradition. She runs her family as if she were a general, and tries to run much of the greater world the same way. She’s obsessed with her Southern ancestors, the family silver and all things having to do with society. Outsiders – at least those who haven’t run afoul of her for some transgression – may think Lenore is beautiful (more beautiful than Sookie, of course), charming and interesting, but Sookie finds her to be maddeningly overbearing. Lenore has always pushed Sookie into roles and activities that didn’t really suit her, and she’s never hesitated to let her daughter know just how woefully Sookie falls short of Simmons standards. Because this is only the first of many surprises in this book, it’s not too great a spoiler to say that Sookie discovers that she was adopted, and that her birth mother was from a Polish family in Wisconsin named Jurdabralinski. And with that, the story begins to move back and forth between the Jurdabralinski family’s adventures around the time of World War II and Sookie’s attempts to discover who she really is and what that means. The book, in its own way, explores a number of serious themes – family, identify, courage, love, loyalty. And Flagg weaves in a lot of fascinating history, about the WASPs – Women’s Air Service Pilots – in World War II, and about the effects of that war on U.S. society in general. But, in her inimitable way, Fannie Flagg also gives us many moments of wonderful humor that somehow manage to avoid becoming caricature or slapstick. There’s a wealth of material here. There’s the society of a small Southern town where everybody knows everybody else’s business, or makes up any details or explanations that might be lacking. And then there’s the novelty of four good-looking sisters (sometimes on roller skates) running the family gas station while their brother is off fighting the war. The stories of the early women pilots and their experiences in the air and on the ground could be a fascinating book in themselves. Sookie’s quest for understanding takes her as far away as California and Wisconsin and introduces her to people and ways of life very different from the world she’s always known. Along the way, she discovers that not being who you think you are – or who you’ve always been told you are – can be a very good thing. This novel is funny, wise, warm and heartening. Read it. Listen to Fannie Flagg herself read it; she’s especially good at doing “Oh, Lord, …” just right. Then read it again if you want. You’ll be smiling, too. This entry was posted in Southern Fiction and tagged Fannie Flagg, Southern fiction, WASPs, women's fiction, World War II. Bookmark the permalink.